In The Kota, Book One in the Kota Series by author Sunshine Somerville, the reader is taken along on an absolutely fantastic journey on an Earth that is very different from the one we know now. The world is being threatened, both by ongoing and seemingly unsolvable wars as well as the DRK virus, one that threatens to kill off life as we know it. A series of prophecies indicate that there will be four children, children who will become Warriors, and they are the world’s only hope. These children, including our protagonist Trok, may not be ready for the responsibility placed upon them, and Trok certainly doesn’t feel ready for the role of leader that he seems to be destined for, but without them, there is no hope. The Kota was a fantastic, fantastic read. Young adult or not, any lover of fantasy should definitely pick this book up and give it a read. It grabbed me by the throat from the very beginning, and I read it in voracious chunks until I got to the very end. Note: This is not a short read, it’s more of an epic, but it absolutely worth it, and when you get to the end, you’ll be hungry for more. Luckily, The Kota is the first book in a series, and we can look forward to enjoying more of this awesome story in the second installment. Author Sunshine Somerville is a truly emerging talent in this genre, and I can’t wait to see what she has for her readers next! Virus DRK is spreading across Eurasia at an alarming rate. Rumored to be a new biological weapon or a bi-product of some undisclosed scientific experiment gone wrong, DRK is infecting everyone internationally and no one claims to be responsible. Those infected lost their sense of humanity and became raving, conscienceless zombies. A group of people, the Kota, claimed to have foreseen these events through their prophecies. When strange lights appear all over the world, the Kota asserts that the event is foretold in one of their prophecies too. Author Sunshine Somerville impresses me with her prose right away as The Kota (The Kota Series, Book 1) opens with a fascinating, thought-provoking prologue. The Kota is an engaging read about the prophecies of four children who are destined to save the world. Five hundred years later, when these children/Kota warriors are born, they need to end Dominion tyranny which rules Earth's dwindling population – whether they’re ready or not. Cryogenic chambers, genetic experimentation, portals to other dimensions – these are exciting aspects that would delight any sci-fi fans. The depth of the world-building is amazing. The story of how the Kota Warriors come to be – the Leader, Hunter, Seer and the Fighter – has some classic sci-fi essence told through a fresh perspective. With abilities such as dematerialization, enhanced strength and telepathy, the action scenes are enjoyable to read. Their guardian Trok is one of the best well-developed characters I’ve ever read. 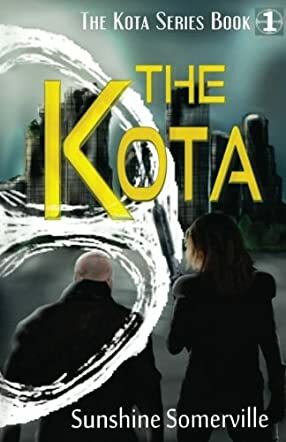 The Kota series is an ingenious addition to the sci-fi/dystopian genre, a commendable work from Somerville. Wow! If you’re a reader who loves fantasy, loves an epic read, and loves to be surprised by what they are reading, then I have the perfect read for you! The Kota, Book One in the Kota series by author Sunshine Somerville fits the bill for all I mentioned above. A completely unique read in the fantasy genre, something that’s becoming a rarer and rarer thing to find for true fantasy fans, the story follows the Trok and the other children who are prophesied to be the Kota Warriors, the only ones able to save Earth from the deadly DRK virus. The virus, as well as ongoing warfare, threatens the very existence of all who remain, and the Kota Warriors, whether they are ready or not, seem to be the only hope. I so, so enjoyed this book. The Kota is full of adventure, excitement and intrigue, and author Sunshine Somerville has done an absolutely amazing job in world crafting. Her unique and engaging style will truly have readers hooked from the very first page, all the way to the last. In fact, the best piece of advice I have for any reader is to be sure you have a decent chunk of time to read it once you start. You simply will not want to put it down! I highly recommend The Kota and am also thrilled to see that this is the first book of a series. I can’t wait to get my hands on the next installment, and will certainly keep a lookout for any new offering by author Sunshine Somerville. With her unique voice and obvious talent, she is certainly an author worth watching!